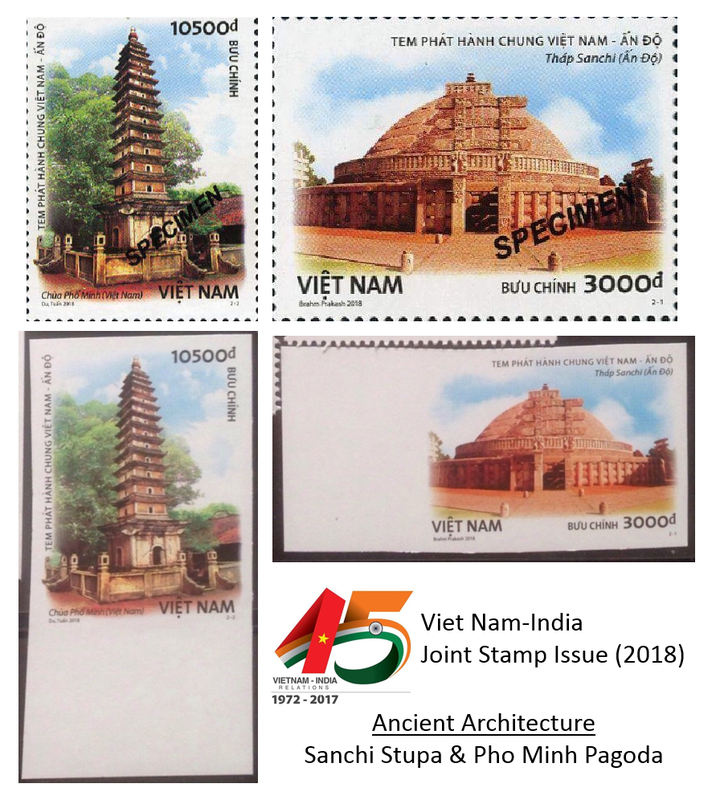 In a surprise move, India and Viet Nam released a joint stamp issue on 25th January, 2018 in New Delhi showcasing two historical monuments associated with Buddhism. 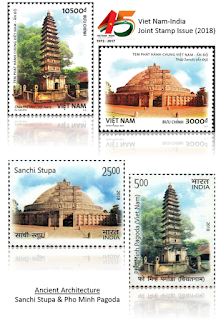 Sanchi Stupa from India and Pho Minh Pagoda from Viet Nam were depicted on the two stamps, which were issued from both countries in identical designs. Viet Nam and India celebrated 45 years of diplomatic relations, 10th anniversary of Strategic Partnership and 1 year of Comprehensive Strategic Partnership in 2017. I tried to find the genesis of the joint stamp issue and it turns out that these stamps were planned for issuance since early March 2017, but were never really reported in Indian news. I found several news briefs from Viet Nam that describe cooperation between the postal authorities during the visit of the Vietnamese Communications Minister to India early last year. 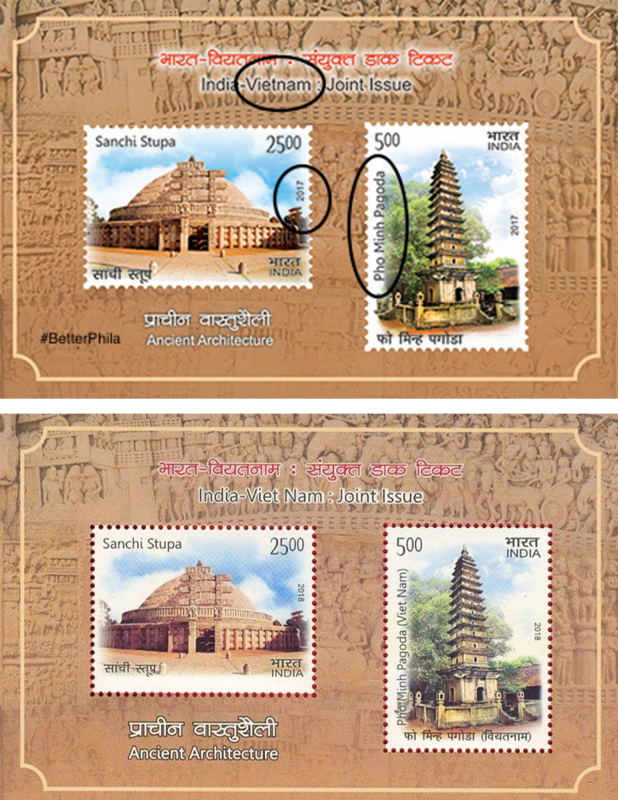 That this stamp was finalized in 2017, was partially confirmed with images of the Indian souvenir sheet that were dated 2017 and have minor design changes in the final stamp issued in late-January (see below). These stamps were dedicated at a joint ceremony on 25th January in New Delhi by postal officials of both the countries. 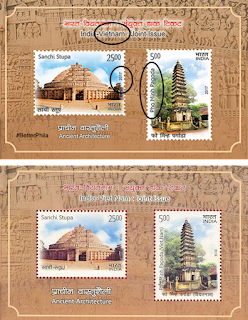 The Indian stamp was designed by Brahm Prakash and the Pho Minh Pagoda stamp by Nguyen Du & Do Lenh Tuan. India Post issued the two stamps in panes of 45 stamps each and a souvenir sheet of 2 whereas Viet Nam issued the two regular perforated stamps, a set of imperforated stamps and a set of stamps overprinted as Specimen. Both the countries issued first day covers cancelled in New Delhi & Ha Noi. Viet Nam & India have enjoyed warm ties since ancient times, going back 2000 years. Trade, cultural and religious connections have led to flourishing relations since time immemorial. Buddhism has played a vital role in bringing both the nations closer and it makes sense to have chosen monuments associated with Buddhism to commemorate on joint stamps. The Pho Minh Pagoda/Temple is located in North Viet Nam, about 100 kms south of Ha Noi. The stamp specifically shows Pho Minh Tower, which is a lotus shaped monument built in 1305 during the rule of the Tran Dynasty. The top of the tower is believed to connect earth with the rest of the universe. This temple complex consists of a pond and other buildings built in the 12th century during Ly and Tran Dynasty rules. The Indian monument of Sanchi Stupa is the oldest stone building in India, built in 3rd century BC by King Ashoka. The Stupa complex comprises of the main structure, which is a hemispherical dome, but several smaller temples and monuments are present on this UNESCO World Heritage (1989) site as well. The main stupa is surrounded by a circular wall and four gateways in four directions. The monuments in Sanchi are located on a small mountain, and the area is quiet, ideal for solitude and for monks to pray. One can purchase the Indian stamps from ePostOffice (online) and by contacting Vietnam Stamp Company on Facebook, which is selling Vietnamese stamps close to face value. 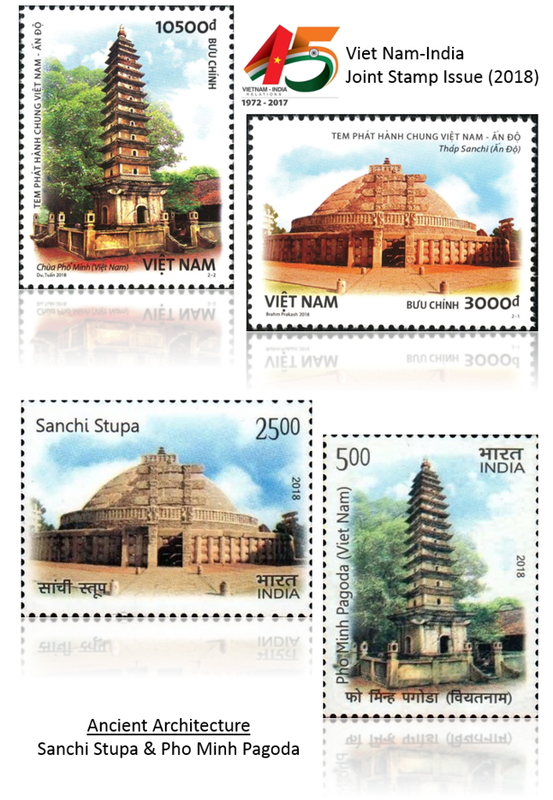 Identical stamps for Viet Nam-India Joint Stamp Issue (2018). India Miniature Sheet for the joint issue with Viet Nam. Check out the design version from 2017 (above). Specimen & Imperforate stamps from Viet Nam for the joint issue with India.